I'm excited to share a new design and announce a new KAL for the month of August. Meet Teddy the Picnic Bear! Teddy was designed exclusively for the Spartickes Dyes Holiday Club for the month of July. He will now be available to the public for purchase on August 1! 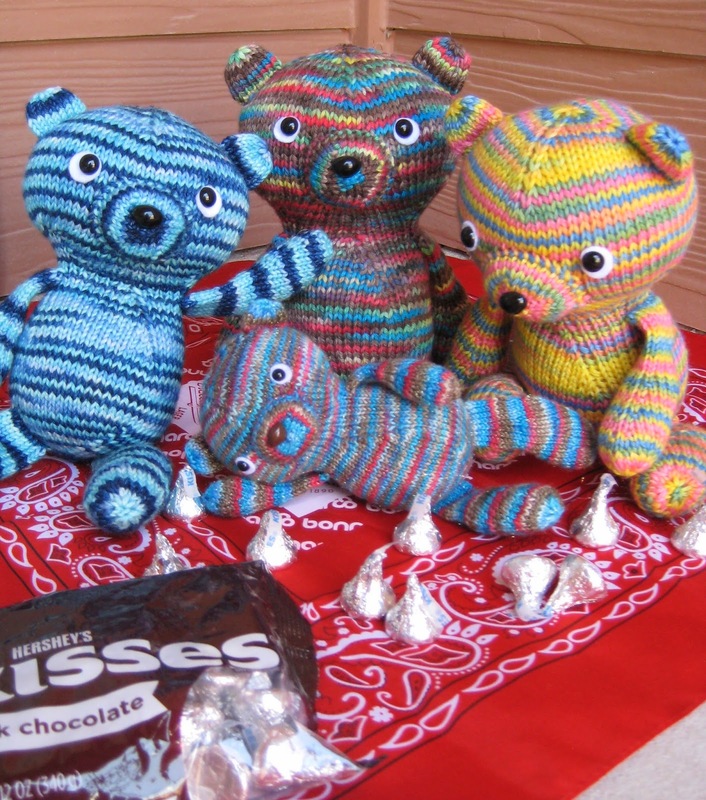 Please join us in the lemknitcrochet designs group for an August KAL of Teddy. I can't wait to see your Teddy and look forward to knitting a few more myself :) I'll be back soon with a blog update on my first trip to Disney World! 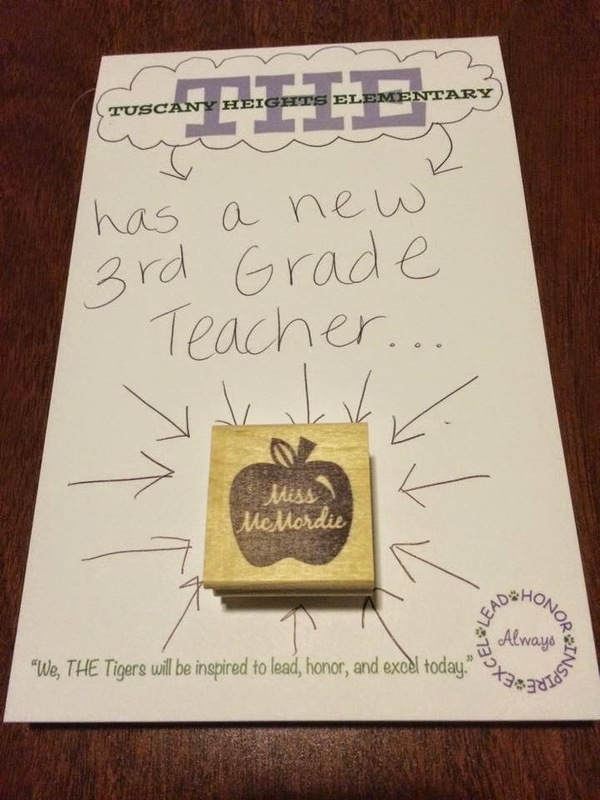 Thank you to everyone for supporting me and keeping my chin up in my journey to become a teacher. I can't wait to make every single one of you proud! The second it arrived, I caked it up and Cast-On a Monster Cowl by Julia Allen. I was excited to discover that the pattern was perfect for TV knitting because it was SO easy to memorize! I churned this sucker out in 6 days, and couldn't be any more pleased with it. The yarn is from White Birch Fiber Arts and is on a DK base. 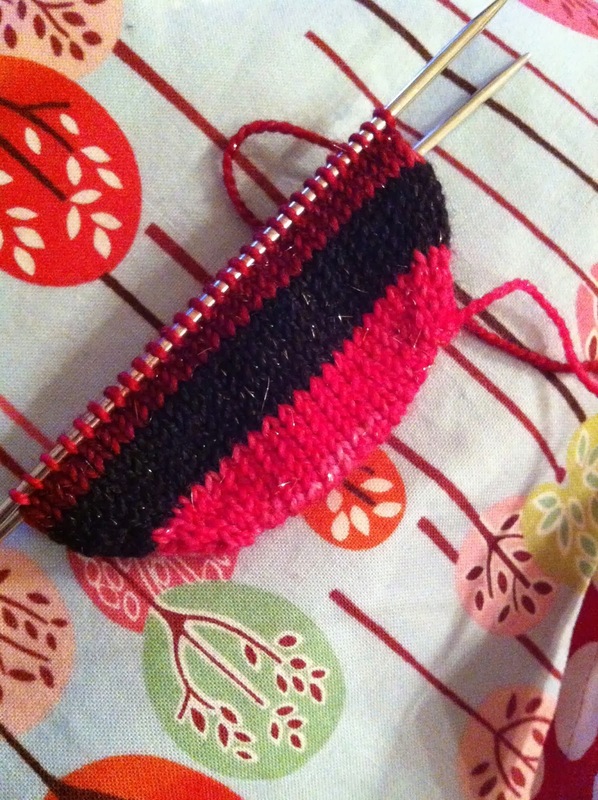 I am officially addicted to gradient stripes, they are so much fun to knit! 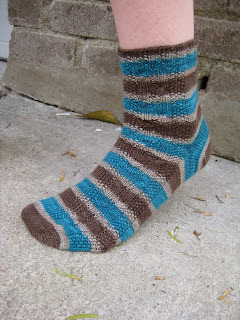 ...a weaving-in-all-the-ends-so-my-socks-are-finished problem. Look at them! Look how pretty they are! But it's hot out and I know I can't wear them, and so the problem continues. I'll get to it eventually right?! I've "finished" all these pairs of vanilla socks in the past few months. The green pair to the far left is Desert Vista Dyeworks Viso base in the Zombody Go Braugh colorway. The purple/blue pair to the top right is Fibernymph Dye Works Bedazzled base in the Ice Palace colorway. The bright, rainbow-y awesomeness on the bottom is White Birch Fiber Arts 80/20 base in the Nothing Says Screw You Like a Rainbow! colorway. Can I also add that these are my FAVORITE bases from these dyers?! Viso is strong and soft, Bedazzled is squishy and SPARKLY, and the 80/20 is the only 80/20 I've ever LOVED (soft and squishy like BUTTER!). Now that we've got that out of the way (whew! ), let me share with you my little haul from the Yellow Rose Fiber Festival in Seguin, Texas. It began the day after school let out for summer (how convenient!) so I drove over with my friend Lori from work. It was a small venue but had a lot of pretties. I ended up picking these beauties below, but man was it hard to pick! I decided I wanted to buy from Texas dyers only this year. To the left is a beautiful skein from a San Antonio dyer, Heavenly Fiber. The colorway is named Fairy Stories and it's even more beautiful in person! It's on her sparkly base and SUPER squishy. The dyer was very nice and I plan to definitely buy more from her in the future. To the right is an awesome skein from Little Monkey's Stitch & Spin. It's a sparkly gradient and I can't wait to find something special to knit with it. 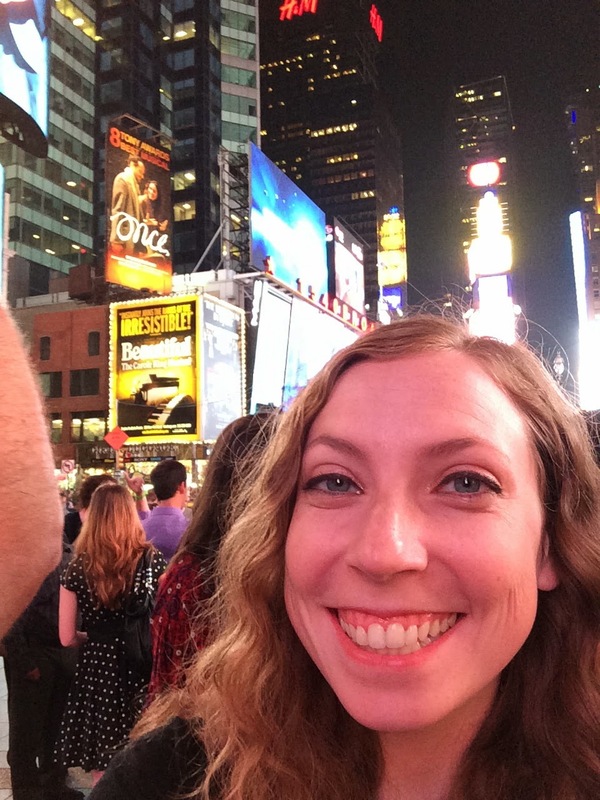 A little over a week ago, I visited New York, New York! My sister is moving there for an internship, so the whole family went up to get her settled and see the sites. We had fun, and did all the tourist-y things we could fit in. I'm glad I got to go, but I am also happy to be back in Texas with TREES and CLEAN AIR and SPACE! Ha! Fortunately for me, I was able to make it to a LYS, just off of Madison Avenue before we left. The store was a little shop on the second story of a little building, we even had to be buzzed and let in! The shop is called String and had lots of very upscale yarn. They dye their own special yarn there, and even have their own special brand of cashmere Koigu sold only in their shop! I ended up choosing a lovely 50/50 silk/cashmere skein so that I can finally knit a little pair of ear warmers. It's so soft and squishy! For my trip to New York, I decided to stash dive and CO a pair of vanilla socks from KirbyWirby Yarns on her Honey BFL base in the Don Draper is a Pimp colorway. I'm not usually a fan of BFL but this base is strong without being stiff, it's fantastic! While knitting on them I decided I wanted to try something new and so I knit my first Fish Lips Kiss heel. ...it's magical! It looks amazing!! So while at first I thought "WHAT HAVE I DONE?! 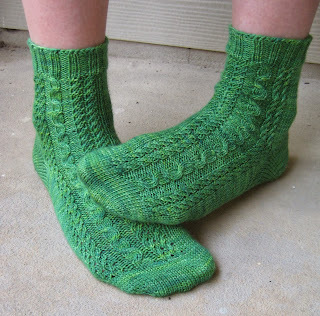 ", I am now very pleased with this heel and see doing it again soon. It was quick and easy to memorize the pattern and turned out looking great. 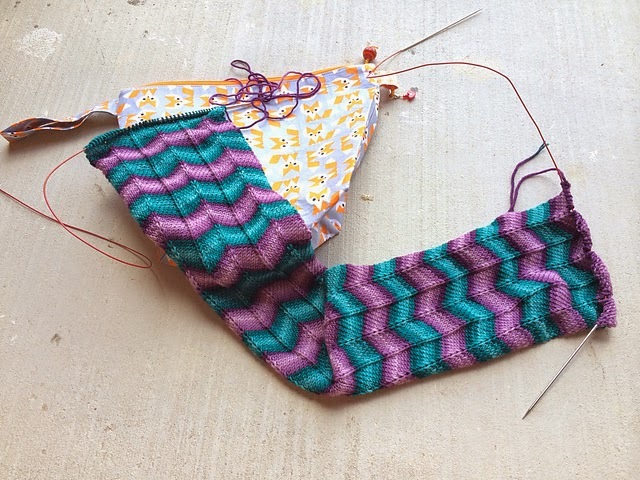 The only thing that still bothers me is that it didn't matchy-matchy up with my next stripe, but I'm sure I can figure out how to make it work a little better whenever I knit my next FLK heel. That's about all for now, but I have to leave you with a little teaser. Now that it is summer, I have time to design again! I was contacted by MariGayle of Spartickes Dyes months ago and asked to join in and design a pattern for her Holiday Club. We put our heads together and decide to dye/design based on the holiday of Teddy Bear Picnic Day in July! The pattern will be exclusive to club members throughout July (my club month) and then it will be released to the general public in August. I can't wait to share what I've come up with, this is a new favorite for me. The club colorways (yes 's', there's TWO!!) are perfect and I can't wait to share how they look all knit up. For now, I leave you with a teaser in a non-club colorway, still in black and white so it will be a surprise! I'll be back soon (I promise!) with a full pattern reveal and more chatter. Hope you are all enjoying your summers! It's been a hectic few weeks over here in the lemknitcrochet household. We've been traveling a bit and enjoying time with family and friends. 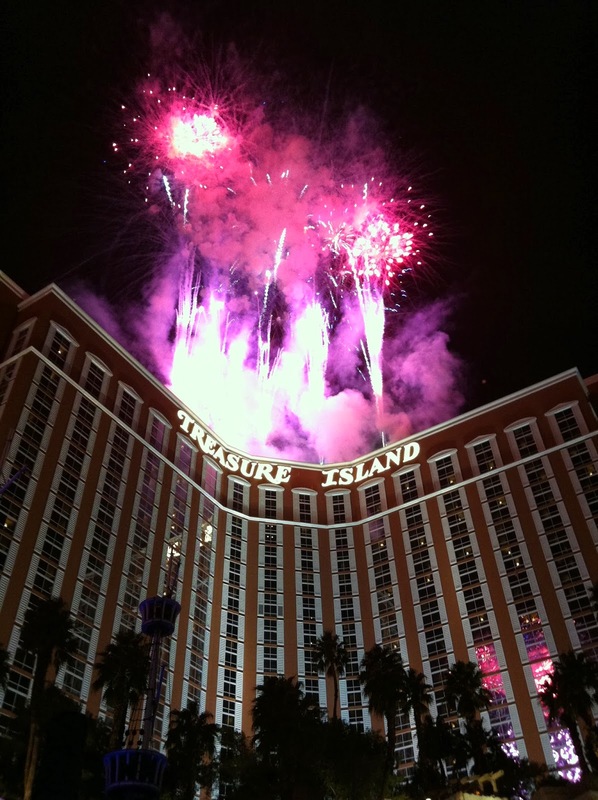 I just got back from my very first trip to Las Vegas and had a lot of fun! 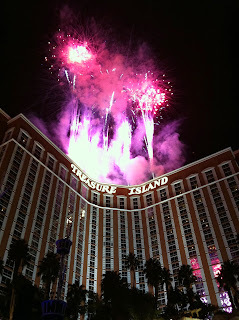 We even had VIP seating for the fireworks show at Treasure Island, it was a New Year's Eve to remember. I have decided that this year I plan to focus more on blogging and designing, so make sure to watch the blog because there are already some exciting things in the works! Speaking of, how would y'all like a new teaser? I am taking January off of KAL's so I can focus on knitting up samples of a new design. With a new design....y'all know there must be a new KAL! I can't wait to see what 2014 holds for me this year and look forward to sharing it with y'all. I'm here with a drive-by 'Hey! I released a new pattern today!' post. I am excited to finally share my latest design, Midnight Garden Cowl. This design was created on a whim. 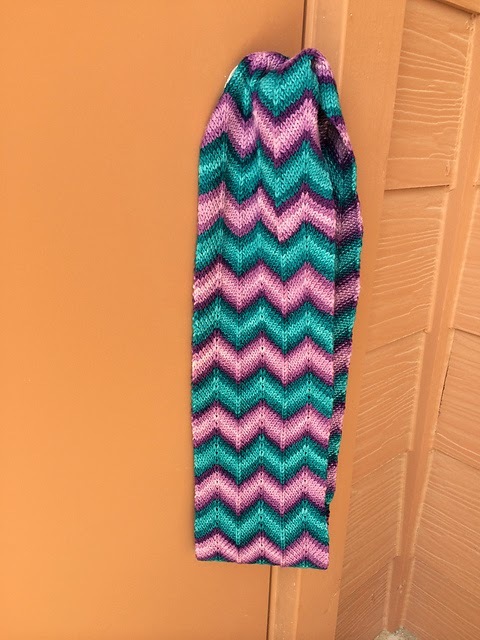 I wanted something that was easily adjustable, quick to knit, and fun! 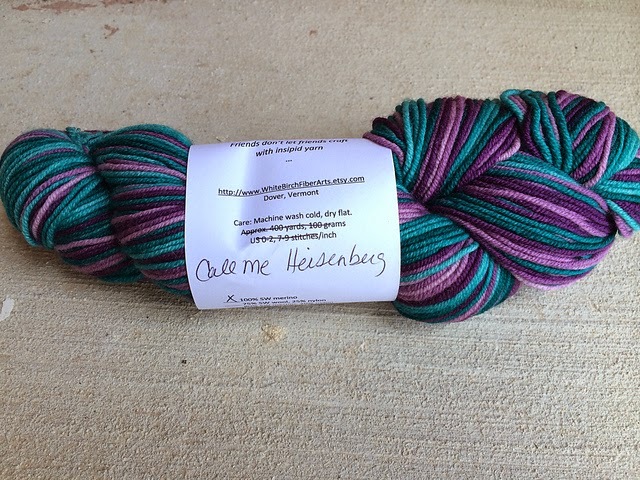 I picked a beautiful one-of-a-kind skein of yarn I had in my stash and let it design itself. The result? A cowl ready for a midnight snowstorm. 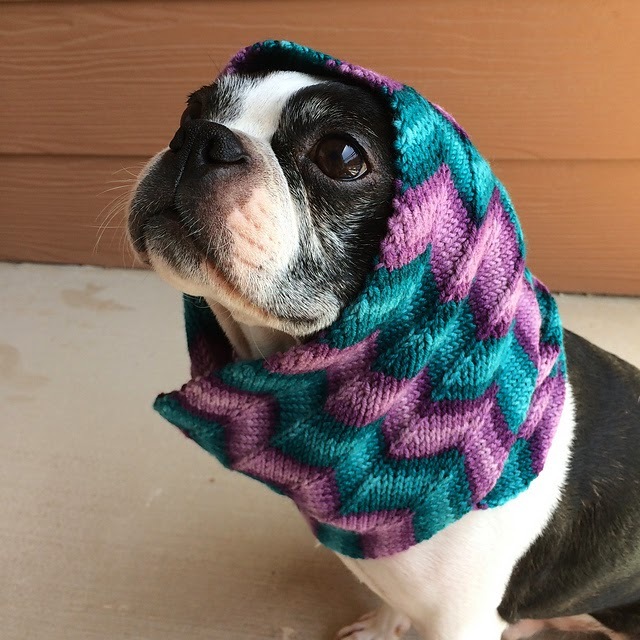 I love it and I hope you have fun knitting one for yourself – or a friend! The pattern contains 5 pages of written directions, including a page with picture tutorials and a link to an exclusive video tutorial to help guide any knitter through one of the special stitches in the pattern. There is also a designer’s note at the end of the PDF that contains directions of how to alter the length of your cowl to a smaller or longer version. This is the perfect pattern to help you get rid of any special skein of worsted that you have stashed away! It is available for purchase on Ravelry right now and I will be adding it to my Etsy store this weekend. I hope y'all like it! Feel free to come and chat about it in the lemknitcrochet designs group on Ravelry. We have a fun KAL for December going on where you can knit ANY of my designs to participate! Even those old ones you forgot to finish ;) See ya there! I hope everyone has had a safe and happy Thanksgiving! I just wanted to write a quick post to let y'all know that I have just created a coupon code for my Ravelry shop that will be valid until 11:59 PM CST on Monday, December 2. It's already active and ready to use - I figured it would be nice to start it a little early. Use the coupon code MONDAYMONDAY for 20% off all patterns in my shop! Enjoy! I will be back soon with a new KAL announcement and an awesome new pattern reveal. Donate and support the podcast!